On October 2, the Wildlife Center admitted adult Bald Eagle #18-2865 from Accomack County. The eagle was observed swimming to shore at a campground; upon reaching the shore, the eagle was rescued and taken to a nearby wildlife rehabilitator for assessment and stabilization. The eagle was transferred to the Center the following day. Upon admission to the Center, the eagle was bright, alert, and standing in his crate. An eye examination revealed retinal tears in his left eye. The eagle had blunted talons on both feet, and his right leg was swollen and bruised with obvious puncture wounds; the wounds were necrotic and infested with maggots. Radiographs revealed a previously healed left wing fracture, but no fractures were identified in either leg. The veterinary staff estimated that the injuries were about a week old. Based on the location and size of the wounds, it’s most likely that this bird got into a fight with another eagle. The veterinary staff cleaned the wounds using a medicated flush. Debridement and closure of the wounds was planned for several days later when the bird was more stable and the maggots had been entirely removed. The bird received anti-inflammatories and fluids, and the veterinary staff started a course of antibiotics and daily eye drops. Due to the retinal tears, the eagle is automatically placed on a three-month hold; in order to properly assess any long-term damage to the bird’s vision, the staff will monitor the bird during the next few months. By October 4, the eagle’s puncture wounds were scabbing; Dr. Peach says that debridement of the wounds is not necessary at this time, as the wounds appear to be healing. Unfortunately, the eagle is not bearing weight on his uninjured leg (the left leg) and the reason is unclear; the eagle responds to stimuli appropriately in both legs. The veterinary staff will continue to monitor the eagle and will perform further diagnostics if the bird continues to bear weight unevenly. Your donation will help this eagle -- and the other 2,800 animals the Center will help this year. Thank you! Bald Eagle #18-2685 was successfully released at Tall Pines Harbor Campground on the Eastern Shore of Virginia. There was a crowd of about 50 people there, and Ed said that the eagle was an incredibly strong flier – the strongest he’s seen in the past few years! Bald Eagle #18-2865 has been flying well during the past couple of weeks in flight pen A3; the bird has good stamina and strong flight. Recent blood work was within normal limits, and the eagle’s final eye exam was also within normal limits, indicating that the bird has no lingering or developing eye issues from its initial injury. The veterinary team declared the eagle ready for release. 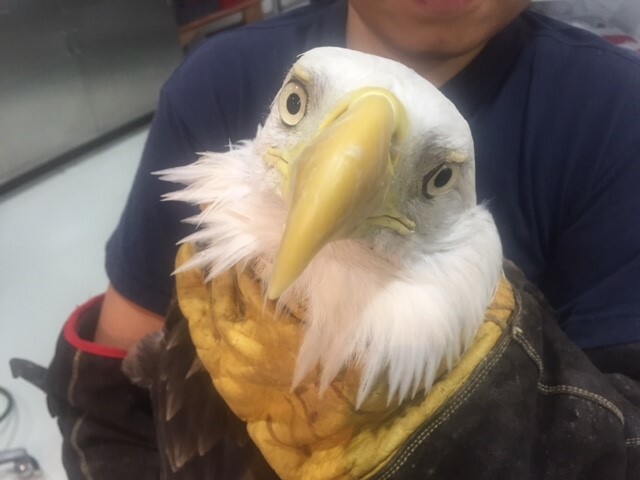 The Bald Eagle will be returned to Accomack County and released at Tall Pines Harbor Campground [8107 Tall Pines Ln, Temperanceville, VA 23442], where it was initially rescued in October 2018. President Ed Clark will release the eagle on Friday, January 11 at 1:00 p.m. The release is free and open to the public; those planning on joining Ed for the release should email RSVP@wildlifecenter.org. At the campground, meet at the Log Cabin Store/Office. Prior to the release, wildlife rehabilitator Brie will band the eagle with a silver band. No transmitter is currently available to fit on this eagle. On December 3, Bald Eagle #18-2865 had a follow-up eye examination to check on the retinal tear that the veterinary team noted on admission. The eye appears stable, and, at this point, should not compromise the eagle’s eventual release. One additional eye examination is scheduled for later this month; the Center veterinarians typically like to observe raptor eye injuries for three months to ensure they aren’t deteriorating. During the recent ice storm, the eagle was moved indoors for several days; when it was safe to return the eagle to A3, the staff discontinued exercise until yesterday’s eye examination. With approval from the veterinary team, exercise will resume today, December 4. The staff notes that the eagle has been making short flights in the A3 flight enclosure, but will need much more stamina and flight capabilities before considering release. During the past ten days, Bald Eagle #18-2865’s appetite improved and the eagle is now consistently most of the offered food. Although the bird is still “knuckling” his left foot, the wound on the right leg is healing well. The staff feel that it’s time to begin exercising the bird regularly. Within the next several days, the rehabilitation staff will move the eagle into a longer, larger flight pen [A-pen] to begin flight conditioning. On October 12, Dr. Peach cleaned and sutured Bald Eagle #18-2865’s leg wound; the wound was scabbing in a way that would prevent proper and quick healing. Later that day, the eagle was moved to one of the small outdoor enclosures [C-pens]. The eagle has had a poor appetite and is still “knuckling” on the left foot; the bird isn’t placing weight properly through the left foot. It’s possible the eagle is feeling pain and discomfort in that left limb, despite no signs of injury; pain could cause the eagle to improperly bear weight and might be inhibiting the bird’s appetite. The veterinary team prescribed additional pain medication for the eagle to see if that will improve his attitude and appetite; in the meantime, they will hand feed the eagle to ensure he is getting adequate nutrition.